Get out of that desk chair and into a beach chair. Trade in the phone line for a fishing line. Sit on the lanai and gaze at 180 degrees of turquoise ocean with gentle white water wave breaks. Watch the surfers catch some waves or jump into the warm water and see an abundance of reef fish or a green sea turtle. Watch for Humpback whales during winter season. Grill some fresh fish or a great steak from your outside dining area and watch the sunset. The house has 2 bedrooms, 2 baths, large living room with dining area, Media center, gourmet kitchen with pantry/laundry area. With a wrap-around lanai to enhance the oceanfront experience, the property will accommodate 2 to 4 guests in Grand Style. This Custom Beach House offers Quality Features throughout. The Living/Dining Room area has dynamic Ocean Views, combined with a tropical ambience. The Interior of the Beach House was designed to provide the most comfortable experience possible. The interior radiates attention to detail with floor to ceiling glass doors that open to the lanai and provide unobstructed ocean views. The design allows for natural tradewind cooling. All rooms have Casablanca Ceiling Fans, dramatic lighting details, and Island-style custom rattan furnishings which combine beauty with comfort to enhance your Kauai Island Vacation. 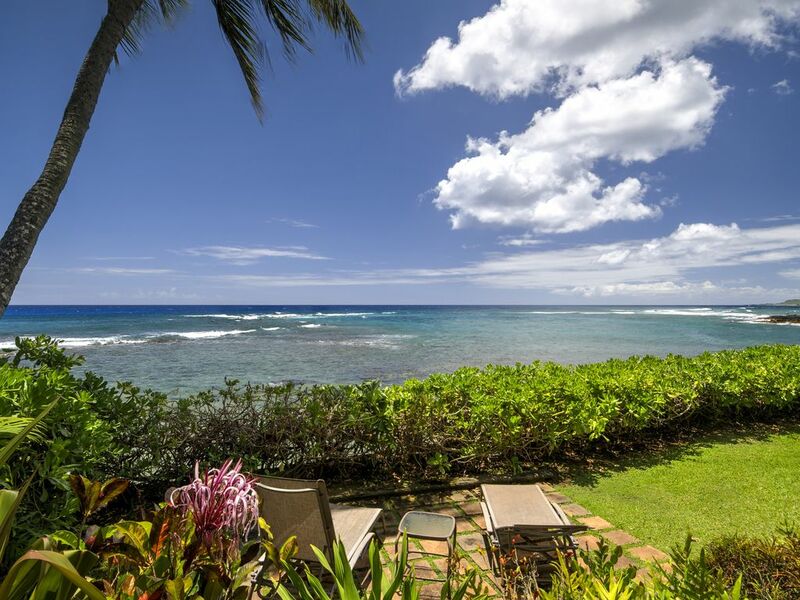 The Poipu Beach House is a Vacation Home that you will plan to return to time and again. DayStar Oceanfront Properties is a small one of a kind vacation rental business. We find outstanding oceanfront lots, then design and build unique beach houses with vacation comfort in mind. The beach houses are not large (2-3 bedroom) but have full attention to detail and comfort. All bedrooms are master suites with full bath and ocean view. Poipu is known for sunny weather with many of the finest beaches in Kauai. 5 of these beaches are located within 5 blocks of the property. Directly in front is a premier snorkeling lagoon and adjacent is Baby Beach. You can walk to all of Poipu's amenities, yet we are on a quiet one lane side street. Inside the beach house it is totally private with 180 degree oceanfront yard. Wonderful location with an amazing ocean view. Any and all amenities are covered in this well maintained property. The owner and property manager were very attentive. The sunsets are spectacular and the pictures do not do it justice. We never wanted to leave. You won’t be disappointed. Aloha! We rented this house for the week with one other couple. It was absolutely perfect! The location is spectacular, the house and amenities in perfect shape, and the response from the owner or representative when a question came up was quickly handled. We spent almost the entire time at the house out on the deck watching/listening to the waves. The outdoor dining was perfect for breakfast, dinner, and our nightly wine hour(s). We only were able to secure the house for 6 of our 10 day stay, and the second property while oceanfront, was not nearly as well maintained as this one. We will absolutely be back. Exactly as advertised. Which is a very good thing. We really enjoyed our stay here. The home is well located, well designed, and manages to achieve a feeling of seclusion as well as you possibly could in this area with immediate access to great restaurants and shopping. We would happily stay again. Clearly Lee, Paula, and Brett take great pride in the home and providing a great experience for their guests. We loved our time here and would highly recommend this house to anyone who wants a true luxury beachfront property. Beautiful, Poipu, Kauai, Hawaii Oceanfront Beach House on the sunny south shore of the garden island. This beach house is located 30 feet from the ocean with beaches on both sides. Watch the sunset into the ocean, and drift off to sleep each night with the sound of waves at your doorstep. Do not be misled by large 'oceanfront' resorts where your room is actually blocks from the water. This romantic getaway is nestled on Kuhio Cove with 'Baby Beach' on one side, and 'Lawai Beach' on the other. If you like to snorkel, this is the spot! This location has some of the best swimming and snorkeling in Poipu. This house is completely private, with separate parking and entry. The neighborhood is tranquil and quiet, yet it is centrally located to all Poipu's amenities. Four additional beaches are located within walking distance, as are golf courses, tennis, restaurants, and shopping. This is the best of both worlds; world-class beaches and ocean, no resort hype, just paradise.